Exquisite White & Maroon Indian Bridal Lengha .. Elegant Gold Bridal Lengha heavily embellished and embroidered all over in golden Zardozi work. .. Heavy maroon bridal lengha, with silver and gold threads decoration. Dupatta in red with floral c..
A stunning beauty in white never fails to create lasting impressions. Flared white lehenga is ado..
A true beauty in deep orange. The lehenga features beige patch along the border that is embellish..
A blend of elegance and opulence you have never seen before. Ensemble in a dreamy and elegant sha..
Gold embroidery on gold net material with stonework. .. Pink, Ivory Gold, Blue Indian Bridal Lengha .. Exquisite and exclusive ghagra in red and ivory is heavily embellished with intricate floral patt.. Exquisite and exclusive ghagra in maroon and green borders is heavily embellished with intricate ..
Red gold maroon Indian bridal lengha. latest designs. ..
blue and gold indian bridal lengha. gold is merged into blue. new design. gold sequences. ..
Red gold maroon bridal lengha .. Exquisite and exclusive ghagra in Pink with intricate floral patterns, using resham threads, zard.. Exquisite Gold with Maroon Borders Indian Bridal Lengha .. Achieving a modern look in a traditional attire, this lehenga in black net with a blue shade lini.. Exquisite Red & Blue With Ivory Borders indian bridal lengha .. Exquisite Red & Green Border Indian Bridal Lengha .. Exquisite Red with ivory Border Indian Bridal Lengha .. Exquisite Red & Ivory Indian Bridal Lengha .. Exquisite Red, Green, Pink & Multiple coloured Indian Bridal Lengha .. Exquisite Gold, Green & Ivory Indian Bridal Lengha .. Exquisite Green Indian Bridal Lengha .. Exquisite Green with mixed colours Indian Bridal Lengha .. Exquisite and exclusive Hot Pink Lengha .. Exquisite and exclusive Hot Red with silver embroidery and a black border .. Exquisite Maroon with silver embroidery Indian bridal lengha .. Exquisite Maroon And Gold Indian Bridal Lengha .. Exquisite Maroon with gold embroidery Indian Bridal Lengha .. Exquisite Maroon With silver embroidery and green border indian bridal lengha .. Exquisite and exclusive Red & Green Indian Bridal Lengha golden Zardozi work. .. Exquisite Purple & White indian bridal lengha .. Exquisite White Indian Bridal Lengha .. Exquisite and exclusive Maroon & Gold Indian Bridal Lengha .. Exquisite and exclusive Maroon & Green Indian Bridal Lengha .. Exquisite and exclusive ghagra in red and white is heavily embellished with intricate floral patt.. Exquisite and exclusive Pink & White Indian Bridal Lengha .. Exquisite Gold & Blue Indian Bridal Lengha .. Exquisite and exclusive Cream & Silver Indian Bridal Lengha .. Exquisite Yellow Indian Bridal Lengha .. Exquisite and exclusive ghagra in maroon is heavily embellished with intricate floral patterns, u.. Exquisite and exclusive ghagra in Maroon and Ivory is heavily embellished with intricate floral p..
Bollywood stores bridal lenghas, rich deep pink dupatta, with ivory top and bottom skirt. Borders..
Golden beige net lehenga and faux georgtte purple dupatta,traditional sequins,resham heavy embroi..
Off white net lehenga choli and purple net dupatta,traditional sequins,resham heavy embroidery an..
Magenta Net Lehenga Choli with Dupatta This intricate design is beautifully crafted with bead.. Include yourself in the glamour of the season with this Brandles Blue Net Lehenga Choli with Dupa.. Pure heavenly design, gently crafted, finest virgin fabrics, created to look perfect and untouche..
Timeless Traditional White and Red Panetar lehenga in net outlined with badhani borders all over ..
Modern White and Red Panetar lehenga in net outlined with badhani borders all over fully detailed..
Be an ethereal diva on your wedding day with this pinkish magenta and red shade lehenga choli. Le..
Be the bride of your dreams draped in this off white shade lehenga choli. The lehenga features ve..
Get a lovely ethnic bridal look in this maroon shade lehenga choli. 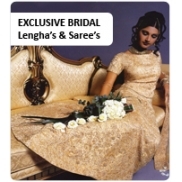 Lehenga in net features intri..
Get a memorable bridal look in this peachish beige and coral pink shade lehenga choli. Lehenga in..
Go for a mix of western and ethnic bridal look by choosing this grey shade lehenga choli. Lehenga..
Move away from traditional colors in style and go for this poetic mix of off white and dark maroo..
Let your bridal look be reminiscent of the evergreen charm of by-gone era in this cream shade leh..
Revel in bridal splendor draped in this designer red lehenga choli. Lehenga is highly decorated a..
Get a second dressed in this gold and reddish maroon shade lehenga choli. The fabulous designs ad..
White and cardinal red embroidered wedding lehenga choli intricate with patch work, butta work, f..